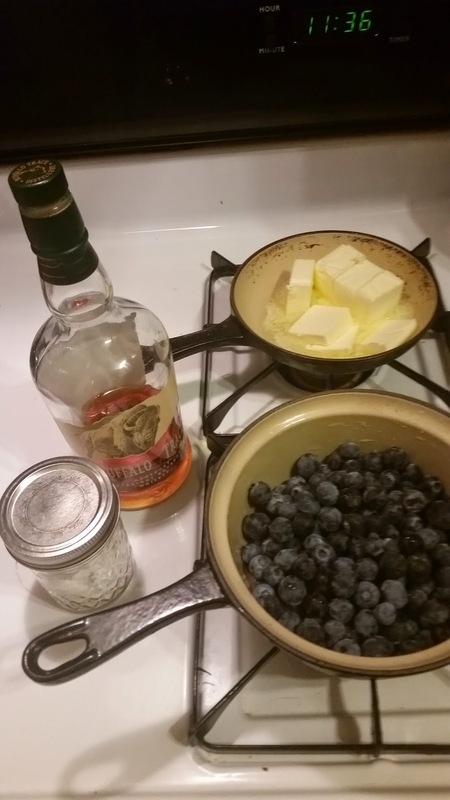 It's blueberry season! I was thinking cobbler, then I was thinking blueberry pancakes, but then I remembered I don't actually love blueberries IN my pancakes, but I love blueberries ON my pancakes. 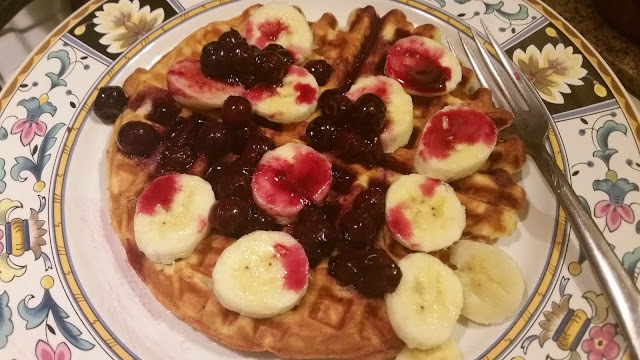 From there it was just a couple more synaptic leaps from the blueberry infused bourbon a kind bartender shared with me recently, the ripe bananas on my table and the waffle iron gathering dust in my cabinet to this inspired weekend treat! 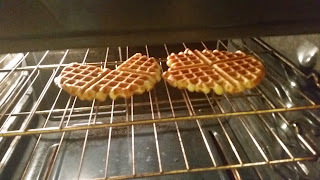 Melt 12 Tbsp butter (1.5 sticks) and let cool for the waffles. 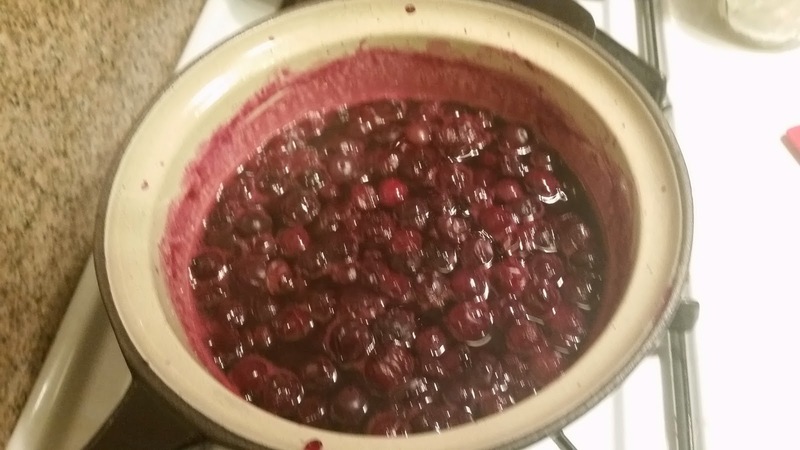 For the sauce: Rinse 1 dry pint blueberries (a little over 2 cups) and remove the stems. 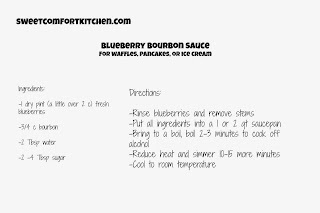 Add them to a 1 or 2 quart saucepan with 3/4 c bourbon, 2 Tbsp water and 2-4 Tbsp sugar depending on your taste and how sweet the berries are. If you don't want to use alcohol, just replace it with water and add some more sugar and a little lemon peel. Bring to a boil, boil for about two or three minutes to let most of the booze cook off, and then reduce the heat and let simmer, uncovered, for 10-15 minutes. Set aside and let cool to room temperature. Try not to dive in with a big spoon. 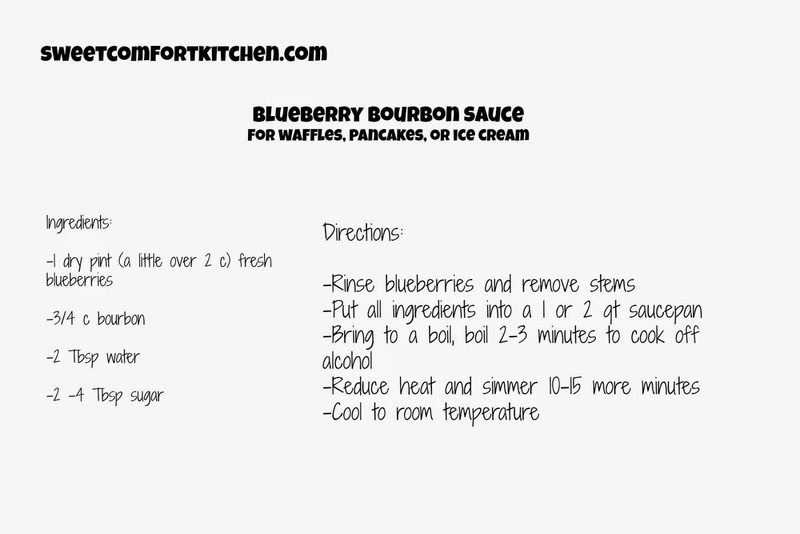 This sauce would also be amazing with vanilla ice cream and/or pound cake, or even on chicken. Separate 2 eggs. Put the whites in a mixer bowl (or a bowl you can use a hand mixer in). 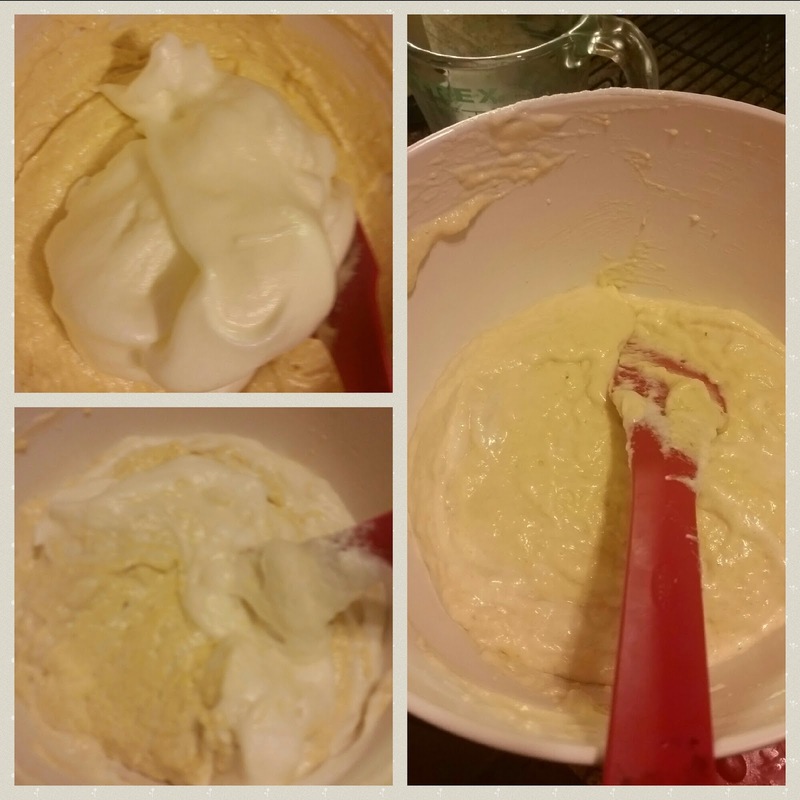 Beat on medium with the whisk attachment or regular beaters until frothy, then sprinkle in 2 Tbsp sugar and turn it up to high. Beat until the whites stay up in a stiff peak when you pull up the beater. 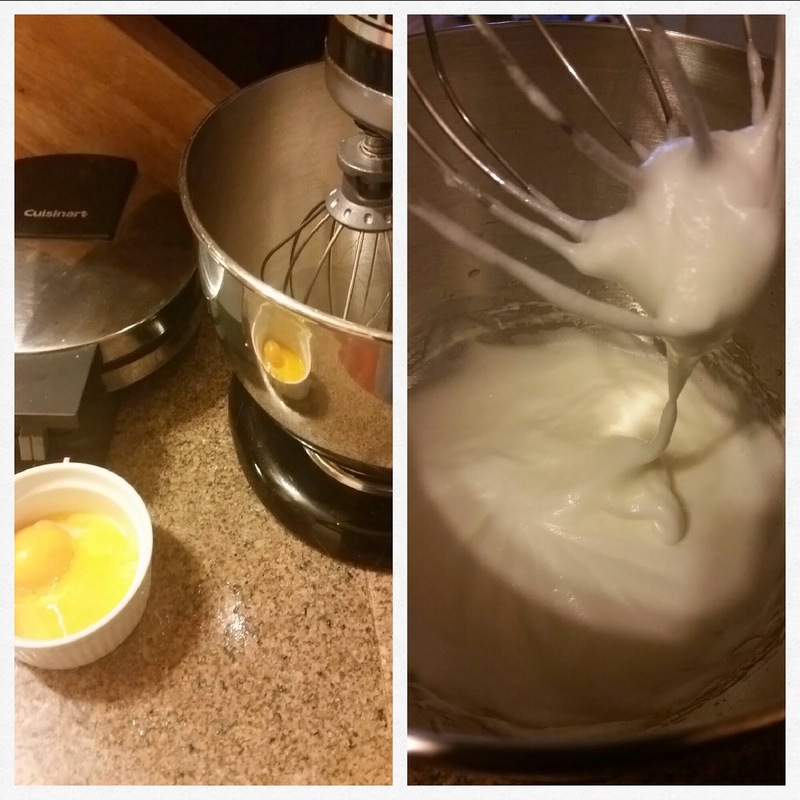 Mix the yolks in a large bowl with 1 1/2 c milk (or 1 3/4 c buttermilk, but I'm out), the melted butter from above, and 2 tsp vanilla extract. 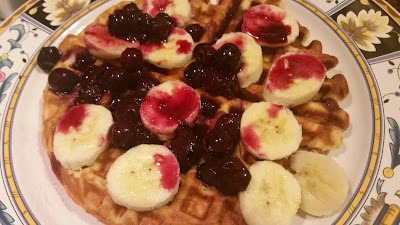 Plug in your waffle iron to start heating it up. 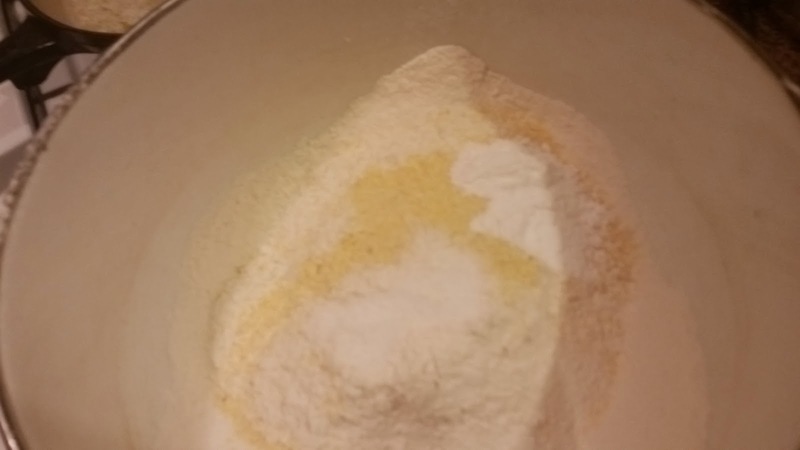 Add the dry ingredients to the wet ingredients and mix just until well combined. 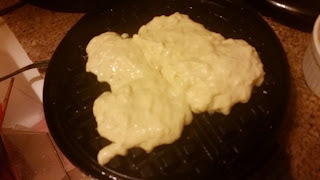 Fold the egg whites into the batter - this will help keep the waffles nice and light. Isn't it a bummer when you order some in a restaurant and they turn out gummy? Anyway, put the whites on top of the other mixture and fold them in gently with a rubber or silicone scraper, pulling up from the bottom and turning the bowl as you go. Melt 2 more Tbsp butter to brush onto the waffle iron. 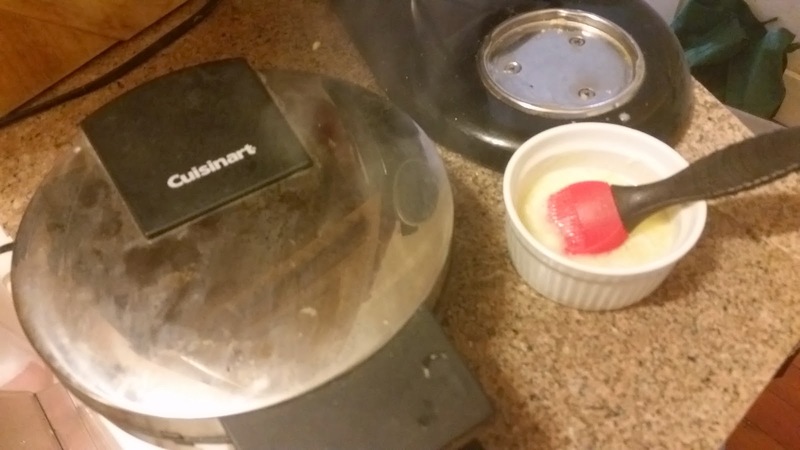 When the iron is hot (the light on mine turns green, but follow the directions for yours), brush some butter onto the top and bottom. You could use oil for this if you prefer. Spoon some batter into each of the four inner corners of your waffle iron. It will spread out once you close the machine. I tend to under-fill rather than over-fill because it's an easier clean-up! Close the iron and let cook until it tells you it's ready. Don't open it before that unless you smell burning! If you over-fill, this will happen. It's no big deal, just put a little less the next time. I scrape the leaks off so they don't have a chance to burn onto the iron! While you wait, you'll see this lovely steam escaping and smell the vanilla. Mmmmmmm. Turn on the oven to 200 degrees to prepare for the final crisping step. 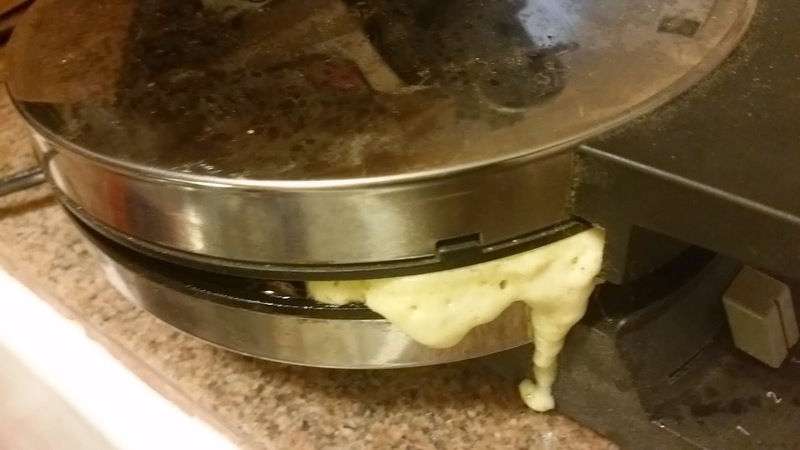 Keep the butter or oil at the ready to re-grease between waffles. Remove from the iron with a fork - don't be a hero and try to take it out with your fingers! 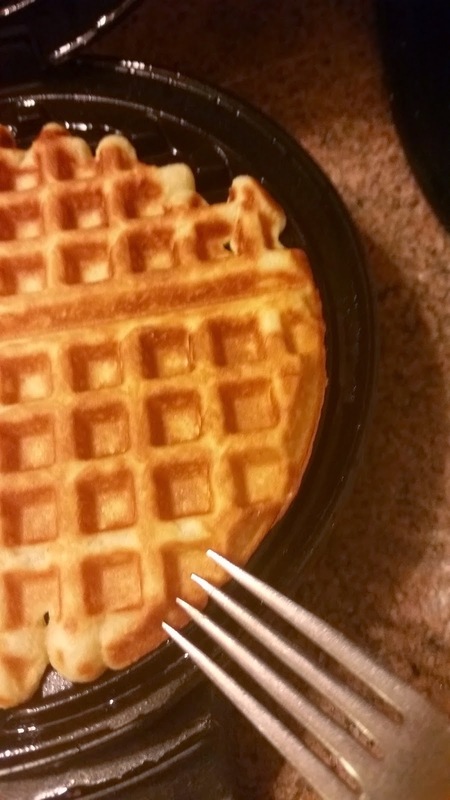 Or don't be lazy like me and decide getting a fork is a bother...stick the fork into or under the edge of the waffle and lift up from there. This color is perfect to me and the first one came out like this! Miraculous! 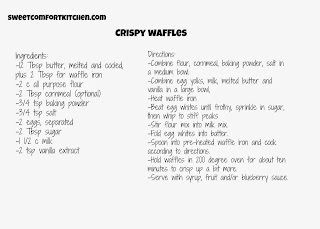 Usually the first is a throwaway like with pancakes, so if it is, just adjust the settings on your waffle iron and get to the next one. 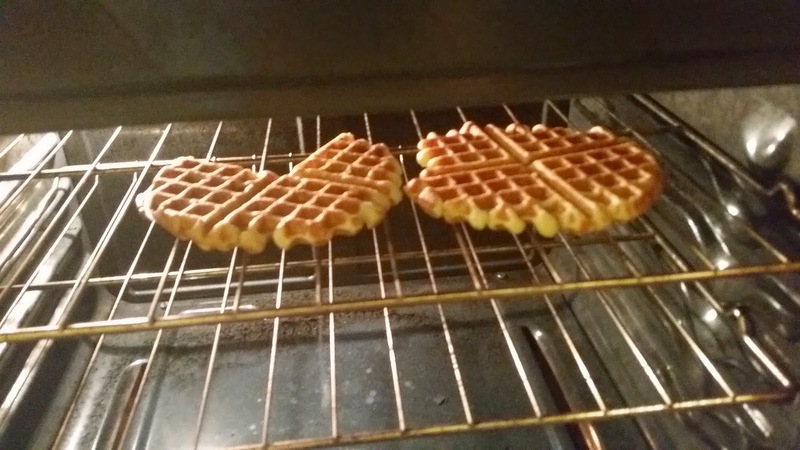 As each waffle comes out, pop it directly onto the rack in a 200 or 250 degree oven. Yeah, I ate a corner of the first one to test it. It was kind of crispy, but the rest was much crispier after 10 minutes or so in the oven. A little extra crispiness will help a lot once the sauce goes on. Slice about 1/2 a medium banana for each waffle, because what goes better with blueberries than bananas? If you don't like them, no biggie, just leave them off. 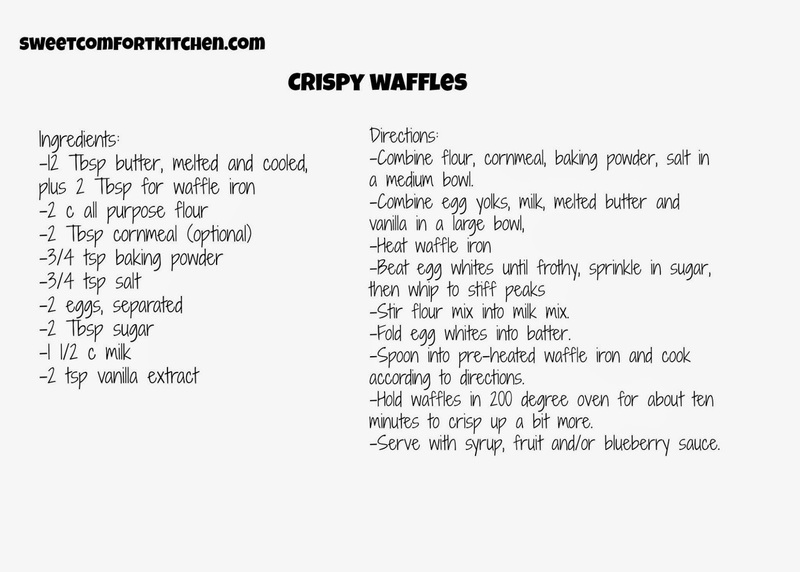 Spoon some sauce over each waffle and enjoy them right away! If the waffles will sit for a while, put the sauce on the side so they don't get soggy. Freeze leftovers and re-heat from frozen in the toaster, not in the microwave.